Author Chat with Mary Cronk Farrell (Fannie Never Flinched)!! 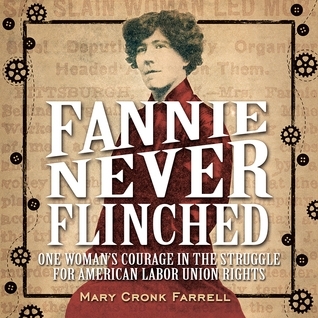 Mary Cronk Farrell, author of Fannie Never Flinched! Below you'll find her interview, more about Mary, and her new book! The day I first stumbled across a mention of Fannie Sellins, I knew I had to write her story. She demonstrated this amazing and rare combination of commitment, courage, and compassion. She committed herself to poor working families, to inspiring them to stand up for themselves against powerful corporations. Fannie knew men could not take the risk of going on strike if it meant their children would go hungry, so she did her best to provide food and clothing for them. In a time when immigrants were feared and hated, she inspired them to believe in the American dream. She convinced women they deserved electricity and plumbing in their homes, healthy food and education for their children. At a time in our history when corporations, federal and state governments and law enforcement all colluded to break strikes and crush unions, Fannie became a powerful union organizer, so good at rallying Pennsylvania coal miners to strike, that company officials wanted her dead. Yet, she didn’t quit. Fannie went about her unglamorous work day in and day out until sheriff’s deputies gunned her down. She was unarmed, yelling at them to stop shooting, while herding a group of children to safety. I struggled over the title for this book for literally years. Even when I settled on Fannie Never Flinched, it was difficult to come up with a sub-title that would tell readers what the book was about. As it is, the sub-title is really long, but luckily with nonfiction books that’s not uncommon. It is really difficult for me to pick one, because Fannie’s story has so many compelling scenes from the garment factory where she worked as a widowed mother of four, to the mining camps where she lived with families evicted from their homes, to the picket lines were she walked with the men. I will whittle my favorites down to two: I love the scene of Fannie speaking in defense of her First Amendment rights, which caused her to be arrested. And I love the scene where she runs along the railroad tracks shouting to the men on the train, telling them they are being brought in to break a strike. In that day, for a woman to be running in public, would be unheard of, and shouting at passengers on a train? Absurd! But she convinced the men to escape the locked train by jumping out the windows, stopped the company from breaking the strike and probably prevented a violent riot from erupting at the mine. Amazing! Now I’m thinking maybe my writing didn’t do it justice. Since this book will be published more than ten years after I first wrote it, and they feel like very long years, I have learned a lot as a writer. Maybe most important, is that I have learned to have more trust in the process and in the story. The writing process is never smooth. Navigating the sink holes, long arduous stretches, unexpected twists and mountain top hikes requires commitment, courage and self-compassion. Though my life as a writer is very different than Fannie’s as a union organizer, and I’m certainly not risking my life or going to jail, she has been an inspiration for me. What I love about the book cover and the entire book, is the beauty and attention to detail. The book designer Maria T. Middleton and all the folks at Abrams Books for Young Readers are committed to turning out works of art. The cover and inside pages of FANNIE NEVER FLINCHED include artistic references to Fannie’s work in the garment industry including a graphic pattern of buttons, thread and bobbins. The striking text, beginning and ending black pages, and the way the photos are slightly shadowed on the page all contribute to the bold feeling of the book. I think the appearance of the book communicates something of Fannie’s strength and her tragic death. Right now I’m working on a YA contemporary novel and another nonfiction book. The NF is about African American women who served in the Women’s Army Corps during World War II. It’s focused on the women’s accomplishments despite the prejudice and discrimination they faced. Researching and writing this book has been hugely eye-opening and painful, as I’ve had to get up close and personal to the hatred and violence experienced by black Americans while they were serving their country in uniform. While fighting against the Nazi’s, Americans perpetrated violence on the basis of similar racist beliefs. I definitely love revising the most! I love having paragraphs and chapters to play with, getting down on the word and sentence level, crafting and creating the building blocks of the story to achieve the greatest impact I can. A recent review described FANNIE NEVER FLINCHED as “cogent” meaning: clear, logical, and compelling. That’s what I strive for in revision. I want my books to be impactful. I really admire the work done by Teaching for Change, which is an organization that provides resources for teachers to connect literacy with real world issues. The organization encourages teachers, parents and students to question and re-think the status quo and inspires all of us to help build a more just world.